Fishing University holds a viewership of more than 139 million households, airing in all 50 states as well as in 51 additional countries. The Gilmer Chamber of Commerce played host to the crew taking them to sites that had the potential to draw in visitors to enjoy what we have to offer here in our area. When the offer to film the show here came, the Chamber viewed it as a strategic marketing opportunity to reach a target audience of potential guests seeking an outdoor travel destination. Within each 30-minute episode of the show, a 90-second promotional spot will be included. The spots will be created to mirror marketing efforts of the Chamber. Hosts Charlie Ingram and Ray Brazier will also include numerous mentions of their location during each show. 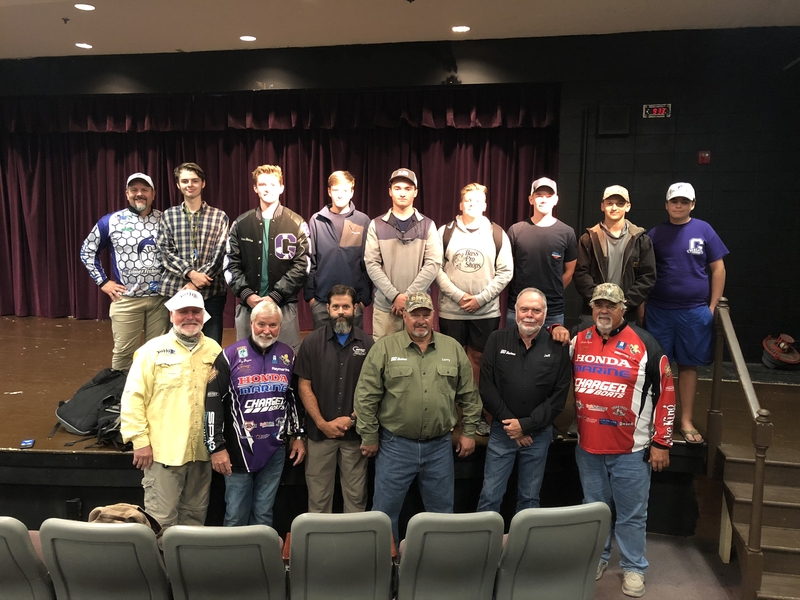 In addition to filming promotional spots and fishing, the hosts and film crew also presented a one-hour program at Ellijay High School and shared with them the importance of attaining an education and the outdoor career options available to them. The school will also be featured during the show. The Gilmer County episode will air 10 times in each quarter all year. As one of the longest running Outdoor TV shows, Fishing University is celebrating 33 years of bringing quality fishing programming to avid viewers. Each week they hit the water accompanied by friends and professionals in the industry, as viewers are engaged in a competitive show that is packed full of ‘how to tips’. Not only is the show exciting, but it also lets people in on ‘tricks of the trade’ from some of the very best in the outdoor industry. Fishing University can be seen on the Outdoor Channel, World Fishing Network and The Sportsman Channel in all 50 states and 51 other countries. To see the entire schedule, go to www.fishingu.com, and be sure to visit Fishing University on Facebook. Charger Boats, Honda Marine, Jackson Kayak, Spro, Raymarine, T-H Marine, Power Pole, Orion Coolers, Cashion Rods, Strike King Lures, StormR, Cedar Creek Beef Jerky, Soft Science Footwear, Lithium Pros Batteries, Gruv Fishing, BALSAX Line, Nite Track, E.A.R.S. Sun Gear, Side Kick Lure Retriever and EZ Loader Trailers.